Yesterday we brought you part one of our Mega Man retrospective, where we looked at the first five main entries in the iconic series. It's all in honour of the Blue Bomber's 25th Anniversary, with this segment spanning the NES to Wii eras of Nintendo systems, with some non-Nintendo systems making a brief appearance. With Mega Man's last entry on the NES, Mega Man 6 did attempt to chart new ground. It entirely revamped the Rush system, with snap-on technology that allowed Mega Man to wear him, rather than to call upon him externally. It also introduced significant branching paths, some of which lead to "false" versions of the robot masters. If you defeat these fakes you will still gain their weapon, but you won't earn the optional Beat parts as well. It's a small reward to collect them all, but the alternate paths absolutely reward exploration. Unfortunately Mega Man 6 feels even less inspired than its predecessor, and that's saying something. Its bosses are bizarre racial caricatures meant to represent various regions of the globe, and while it falls short of being offensive they're not particularly interesting. Unlike earlier bosses, their identities come more from the clothes they're wearing (a turban, a ski cap, a Native-American head-dress) than any real personality. The weapons are similarly bland and it feels more like you get eight new weapons because you have to than because there were eight new things worth using. Mega Man's lone entry on the SNES is absolutely fascinating as an experiment. For the first time in the entire series, the game adopts a whole new graphical approach, and it's an absolute feast for the eyes. The core gameplay, however, will be immediately familiar to anyone who's played any of the games before: you jump, shoot, slide and charge your way through eight robot master levels, before moving on to the final gauntlet. However it did introduce a surprising number of new features, and has actually had more of an impact on later games than some might realise. For starters, it breaks its robot masters into two sets of four, rather than a single set of eight. While this does interfere with the non-linearity to a point — and makes it twice as easy to work out the weakness order — it's an interesting innovation, and it facilitated a second development: intro and mid-stages. Mega Man 7 is the first game in the classic series to take advantage of those, and while they didn't catch on for long here, they absolutely found a permanent home in the Mega Man X series. Mega Man 7 also took the "Rush suit" feature of Mega Man 6 and altered it slightly, but essentially kept it on board. Additionally, there were hidden items scattered about through every stage, and Rush even got a new form designed to help you find them. Because of this, Mega Man 7 is the first game in which reaching 100% completion became a challenge in itself. Additionally, Mega Man 7 introduced a shop feature, which was — almost shockingly — retained in the otherwise stripped down Mega Man 9. We were also introduced to Auto, an ally who'd build parts for Mega Man if our hero could find enough bolts, and Bass, a Proto Man-like antagonist who quickly became a fan favourite. In fact, he'd even co-star with Mega Man for a single game, a spiritual brother to Mega Man 8 called Mega Man & Bass. Mega Man 7 proved to be the swansong for the classic series on Nintendo consoles...at least for the time being. 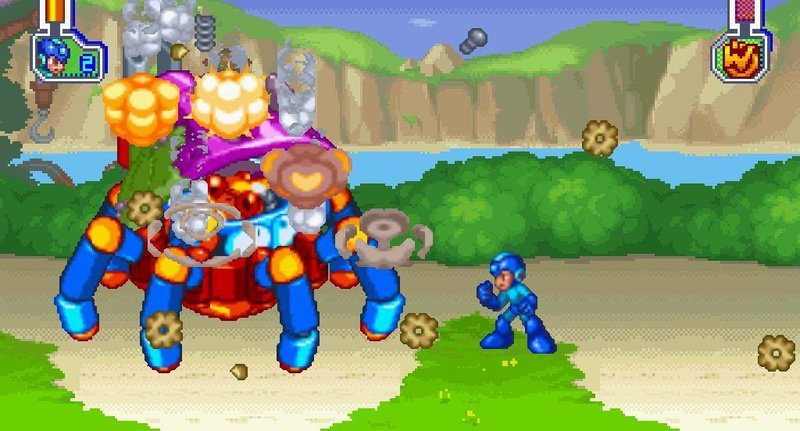 Released on the Sony PlayStation and the SEGA Saturn, Mega Man 8 took yet another graphical approach to the series, but this time reception was a bit more mixed. While the game retained the classic core gameplay, it also introduced voice acting and animated cutscenes, both of which are still widely — and rightfully — mocked today. It makes Mega Man 8 a difficult pill to swallow, and its stages don't really make up for it. The emphasis is placed more here on defeating swarms of enemies than on finding interesting ways around them, and a bizarre mid-stage save point means that if you lose all your lives in the second half, you don't start again from the beginning. This interrupts the "flow" of the game more than it might originally seem, and it makes it feel much more like an experiment than a proper entry. 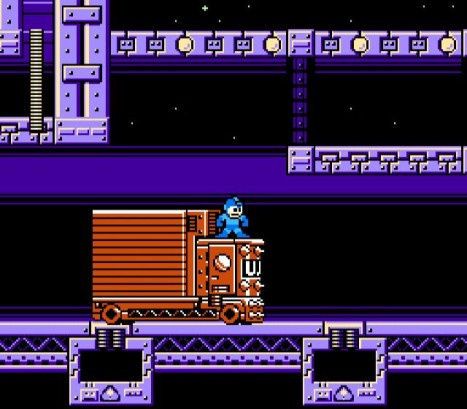 Eleven years later we resumed control of Mega Man, and found him right back where he belonged: in merciless, glorious 8-bit goodness. Mega Man 9 took a look back at the series as a whole and, by and large, said "that's enough of that." Here Mega Man can jump, shoot...and that's about it. The slide, the charge, the midpoint saves...all gone. 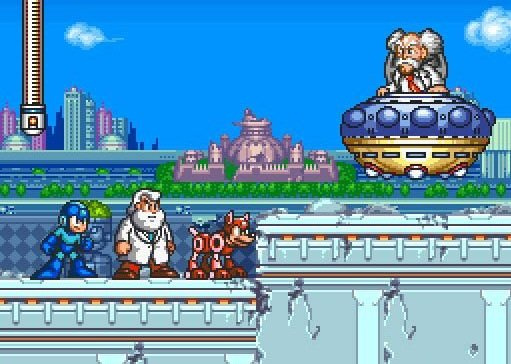 There are 8 new robot masters, an excuse to track down Dr. Wily one more time, and a brutal gauntlet between you and success. Mega Man 9 returned the series to its roots in more than a logistical sense, however. The stage design was the most inspired it's been in ages, the soundtrack was nothing but highlights, and the selection of weapons were the most useful they've ever been, with nearly everything serving a secondary function as a utility as well. What's more, the game featured DLC, giving Mega Man a new stage to fight through, the ability to take a rest and let Proto Man take over, additional difficulty settings and a gloriously addictive endless mode that threw obstacle after obstacle at our hero until he'd finally die. These extra features put even the best Mega Man players to the test, and the ability to compare stage-completion times online made speed runners happier than they'd ever been before; unlockable achievements also gave completionists something to strive for. The main criticisms of Mega Man 9 tended to focus around its unquestionably high difficulty, but for many gamers that's exactly what they'd been waiting for. Mega Man was back. Unfortunately, he wouldn't be for long. At the time of writing, Mega Man 10 is the blue bomber's final console release. Taking a cue — and many in-game assets — from Mega Man 9, we were again provided with a simple jump-and-shoot experience with a retro attitude. Unfortunately it does feel like something of a step back from the previous game. After all, how can anyone improve on Mega Man 9? This game's soundtrack was great, but even "great" didn't measure up to what came immediately before. The weapons selection was unique in the fact that splash damage was often the best way to take enemies down, leading to a more refined approach to combat, but they were significantly less useful than the previous batch. On the bright side, there was an easier setting for the first time since Mega Man 2, more downloadable stages — featuring weapons that you could then carry over to the main game — and the chance to play as Bass for the first time in an 8-bit environment. Mega Man 10 may have felt like something of a step down, but it was by no means a disappointment. In fact, the worst thing about Mega Man 10 is that, once again, we're left with a sense of uncertainty. Where does the series go from here? Will it go anywhere? Will we see a Mega Man 11? And, if so, what form will it take? For a series that often gets derided as repetitive, there are many directions another title could take. It could also, of course, chart a new direction of its own. Whatever it does, we can't wait to see it, and we couldn't be happier to be celebrating a quarter of a century with our colour-changing hero. Nicely done, and I almost agree to all the points you've made. Hope you do a part 3, Megaman and Bass along with the Gameboy titles(4&5 especially) deserve some recognition besides a few references. No mention that Mega Man 6 was never released in Europe in any form at all? Can't believe you let that one slip! Just like part one Phil, part two was an enjoyment to read. I dont have anything to say that I didn't say yesterday. For one reason I never really got into Megaman 7 or 8 and I have yet to play 9 and 10. One thing you forgot to add Phil was that two of the Robot Masters in MM6 Windman and Knightman were winners from a contest held by Nintendo Power. There will be a part 3...kinda. Ok I have to ask this but what is with all theses spammers in the comment section lately? I personally, love MM6 though. The weapons were very useful I thought. MegaMan 9 and 10 for 3DS eShop please!!! MM7 is one of the most underrated of the franchise, IMO. I'm glad the article recognizes its high graphical quality. Also noteworthy that the final boss is quite difficult. All around a solid entry to the franchise--classic Mega Man yet in SNES style. Perhaps one possible template for an MM11? @Pikminsi I've seen Joystiq get plagued by these, they had to completely throw out their old commenting system and bring in a new one because it was such an issue. @Tornado - Agreed! Other than the smaller screen size the actual game was pretty great. I certainly enjoyed it more than 4, 6, or 8. 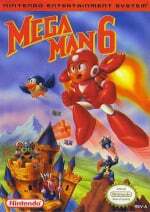 But I found Mega Man 10 quite dull after Mega Man 9 was so excellent. It almost felt like 9 was closer to 1-3 while 10 was closer to 4-6. Less inspired. I STILL want a SNES style Mega Man X9, though! I would have preferred that over Mega Man 10. 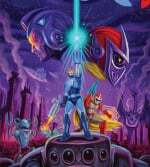 Would a Mega Man X series like this be possible? @coreythepikachu in part one they said they wouldn't include the "X" series, or any of the other spin-offs for that matter. An excellent read! By the way, isn't that picture above megaman 6 from nitro man's stage in megaman 10? I just got it and I thought it was a great way to honor 25 years of Mega Man and again it is for FREE! BTW I thought Mega Man The Wily Wars for the Sega Genesis was pretty good and another greatly underrated Mega Man game. Kinda off topic, but what is the song in the very beginning of the video which Happy_Mask posted? Good, gonna play Street Fighter X MegaMan later today. I believe MM 8 is regarded with more fondnest than you give it credit for. I too happen to really love that game. It's from the MM2 intro and pretty much the go-to theme for these kinds of videos. I guess it reminds me of Little Nemo soundtrack so much I got confused.